This will cause a vacuum to build in the compressor housing and pull oil past the seal. This will be most noticeable when letting the engine idle for extended periods of time. When the engine is running with a load there is enough pressure in the compressor housing to keep the seal seated and the oil from leaking past. Servicing the air cleaner at recommended intervals should keep this problem from occurring. When excessive air pressure is coming from the crankcase the oil is actually being pushed past the seals. Many times oil will be noticed in both the compressor housing and the turbine housing with this type of problem. A good place to start when crankcase pressure is suspected is by inspecting the engines crankcase breather. If this becomes plugged it will cause high crankcase pressure. If it is not plugged but appears to flow an excessive amount of air, it may be a sign that the seal between the piston rings and cylinder liner has been compromised and the engine needs to have a rebuild kit installed. When the oil drain line has a restriction in it, a possible result is that the oil will back up into the bearing housing. When this happens the oil can push its way past the seals and into the turbine housing. If this is suspected, there are a couple of trouble spots to check. Look at the drain gasket for excessive silicone that may have seeped into the line. A second item to check is if the drain line has a silicon rubber section. Sometimes, if the line has been changed with standard heater hose it may swell due to contact with oil and cause a blockage. It will need to be replaced with an oil-resistant silicone hose. If the valve guide seals in the cylinder head pass oil or if the piston rings allow oil to pass it will be expelled out the exhaust manifold. From the exhaust manifold it then travels through the turbine housing and out the exhaust pipe. This is a very common problem and has led to many unnecessary turbochargers to be changed. The turbo will look very suspect and may appear to be leaking both externally and internally. An excellent way to diagnose this is by adding florescent oil dye to the oil. After letting the engine idle for some time, the turbocharger can be removed and a black light used to see if the dye is present in the exhaust manifold. If it is, the oil is coming from the engine and not the turbo. This issue was also covered under oil in the compressor housing, but should also be mentioned here. When excessive air pressure is coming from the crankcase the oil is actually being pushed past the seals. A good place to start when crankcase pressure is suspected is by inspecting the engines crankcase breather. If this becomes plugged it will cause high crankcase pressure. If it is not plugged but appears to flow an excessive amount of air, it may be a sign that the seal between the piston rings and cylinder liner has been compromised and the engine needs to have a rebuild kit installed. A damaged compressor wheel can be a result of a foreign object getting into the compressor housing. Turbo bearing failure is also a leading cause. This can be diagnosed by removing the intake tubing and examining the compressor wheel. If fins are bent, missing, or even just missing a piece the turbo should be rebuilt or replaced. Also, if pieces are missing it is a good practice to have the charge air cleaner cleaned and inspected. This will ensure no further engine damage is caused by one of the pieces entering the intake manifold. A damaged turbine wheel can be a result of internal engine pieces being expelled out of the engine due to a failure. Turbo bearing failure is also a leading cause. 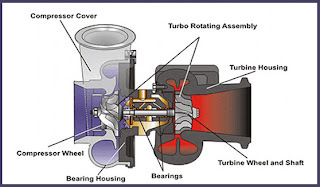 Another known cause is carbon buildup in the turbine housing. This can be diagnosed by removing the exhaust pipe and examining the turbine wheel. As with a damaged compressor wheel, if any of the fins are bent, missing or even just missing a piece the turbo should be replaced or rebuilt. If any pieces are missing, it is a good practice to try and remove them from the exhaust piping. Poor engine maintenance of oil or air cleaner allowing dirt to come in contact with the bearings. Loose turbo clamps allowing the compressor or turbine housing to move. Oil starvation on engine startup or when first installing the turbo. Wastegate malfunction, removal, or wastegate hose pinched. The best way to diagnose a bearing failure is removal of both the intake piping and exhaust piping. This will allow access to both ends of the rotating assembly. Check the bearings by spinning the rotating assembly to ensure it moves freely. Check the end play by pushing and pulling the shaft. If there is any end play the turbo should be rebuilt or replaced. Check the side play by pushing the rotating assembly towards the compressor or turbine housing. Some play here is allowed, and the compressor or turbine wheel may be able to touch the housing depending on how much force is applied. The concern would be if there is excessive side play or “slop” for lack of a better term. If the side play is deemed excessive the turbo should be rebuilt or replaced. For more information on turbochargers or diesel engine parts from HHP you can call us toll free at (855) 447-7278 to speak with one of our qualified professionals.